• 1 Jalapeño pepper sliced. 1In a hot frying pan, cook the Mexican chorizo until golden brown. Break the chorizo down with a wooden spatula until crumbled evenly. Add the potatoes, and finish cooking them. Integrate everything. 2In another small frying pan, add the canola oil and sauté the onion until translucent, add the refried beans and integrate everything. Set aside. 3To bake the sopes, spray a bit of cooking oil on each one and put them on a tray. Bake them for 20 mins at 400C turning once and until crispy. 4Once the sopes are baked, add a thin layer of refried beans, add the Chorizo & potato, and then garnish with some cilantro, jalapeño, onion, crema and crumbly cheese. Top them off with any of the fresh salsas available from Nostalgia Latin Market. Enjoy! 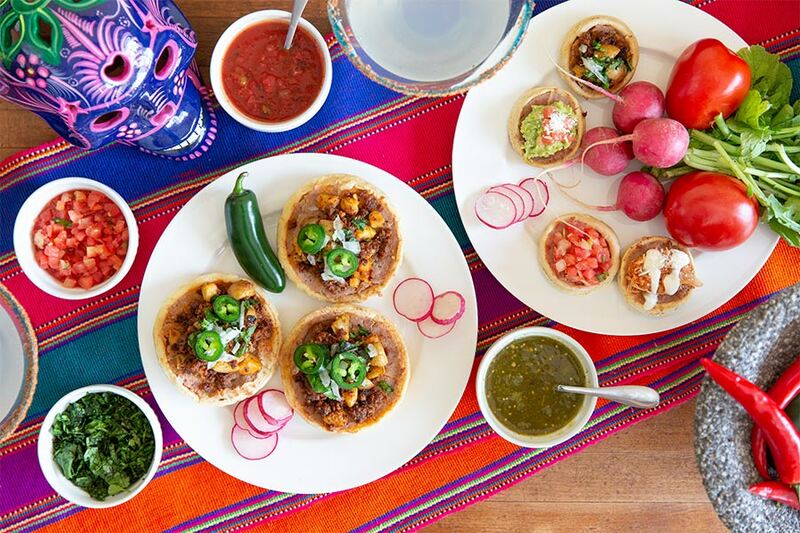 These authentic Mexican Sopes are perfect for Cinco de Mayo, but can also be enjoyed anytime of year. They're easy to make, and come in different sizes. Serve them as a main course or an appetizer. Almost all the ingredients are available at Nostalgia Latin Market, located in Kerr Village.